After all, a match isn’t the same as an adoption. So before you go any further you want to make sure the same fate doesn’t befall you. But what can you do? Changing her mind is an expectant mother’s right and one of the risks that every waiting parent takes when building a family through open adoption. So is there a way to tell whether she’s right for you? And, just as importantly, whether you’re right for her? 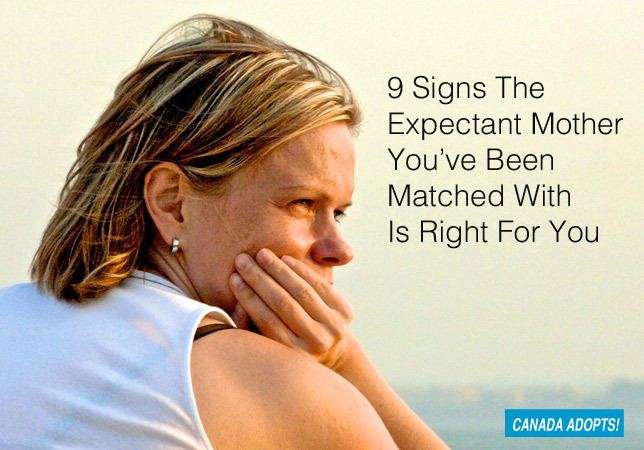 Getting matched with an expectant mother who’s considering adoption is a lot like dating. And just as in any dating scenario, the more compatible you are the greater chance you have of sticking together and building a long and lasting relationship. One thing you need to remember is that an expectant mother is under tremendous pressure and may be looking at other options. Having things in common with you — whether it be something as simple as a favourite TV show or a hobby — can put her mind at ease and help her feel more at peace with her decision and with you. Interests are one thing, but what will really let you cement your bond is something even deeper than that: values. Do you have similar beliefs? Are you guided by the same principles? Are your core values — about life, about child-rearing, about relationships– the same? These values don’t have to be rooted in religion, although that can’t hurt. Instead, they need to be “bedrock” beliefs that make you who you are and guide your decision-making. For instance, if you’re into fitness and healthy living and she’s a smoker, you’re not going to have an easy time prior to placement or afterwards. Some adoption matches feel like they’re just meant to be. If you’ve never been matched, it’s hard to understand. But once you are, you’ll know exactly what I’m talking about . Just ask other adoptive parents. Although they can’t put their finger on it, they’ll tell you that a sense of peace and comfort came over them the moment they spoke to their child’s birthmother. Whether you call it karma or chemistry, things just clicked — and everything seemed right from that moment on. When we spoke to our son’s birthmother for the first time we were so nervous we kept a list of questions handy next to the phone. We were worried that we wouldn’t know what to say or run out of things to talk about. But our fears were unfounded. After a few awkward moments, we found our rhythm. We put our list aside and never looked back. The conversation flowed so easily it was like talking to an old friend. Like a lot of prospective adoptive parents, the thought of talking to an expectant mother filled us with dread. What if we don’t hit it off? What if we say the wrong thing? What if we fall in love with her and she changes her mind? But once we got to know her, all of those fears melted away. Not only could we talk for hours about just about anything and felt like we had known her our entire lives, we found that we genuinely enjoyed each other’s company and couldn’t wait to connect again. Our lives became so intertwined that we stopped thinking exclusively about our needs and started to think about hers. And we felt confident that whatever decision she made — whether she placed with us or not — would be the right decision. Adoption isn’t co-parenting, but you still need to make sure that you and the expectant parent are in sync about how you intend to raise your child, and especially on how you see your relationship unfolding down the road. Things will change and evolve. You’ll move on with your life and so will she. But from talking about the level of contact you want to have to dealing with major life events, it’s still important to have a basic framework to help you navigate the future. The true test of any relationship isn’t how well you get along when times are good. It’s about how you work out your differences when they aren’t. As in any relationship, dealing with an expectant mother requires a lot of give and take. Neither side should ever feel like it’s doing all the work or forced to do things against its will. Instead, you should both feel like equals working towards the common goal of doing what’s best for your child. Adoption involves a lot of planning for the future. So, as great as your relationship may be now, you also need to think about what’s next — what your life will look like after placement. If the expectant mother avoids the topic or refuses to talk about it, it could be telling you something. It could meant she hasn’t thoroughly thought through her decision. However, if she can see herself in her new role and has plans beyond placement, it could be a sign that she’s at peace with her decision and that you really do have a future together. It’s hard to know what any person is thinking about after you first connect with them. And an expectant mother has a lot more things on her mind than most people. Is she making the right decision? Should she go through with her plan? You hope that feels good about you and her decision, but the truth is you never know. From dealing with pressure from her family to her on-again, off-again relationship with her child’s father, there are so many things beyond your control. That’s why, at the end of the day, you need to put your faith in her and treat her with dignity and respect and hope that she feels the same way about you. After all, isn’t that the secret of every successful relationship? Being matched with an expectant mother with an adoption plan can be a joyous occasion. But it can also be a stressful one as you wonder whether she will go through with her plan. That said, from the instant you first speak to her, there are signs that can tell you whether you and the expectant mother are good for each other and help you navigate the uncertain times ahead. What helped you build your relationship with an expectant mother prior to placement? How did you get through the highs and lows?